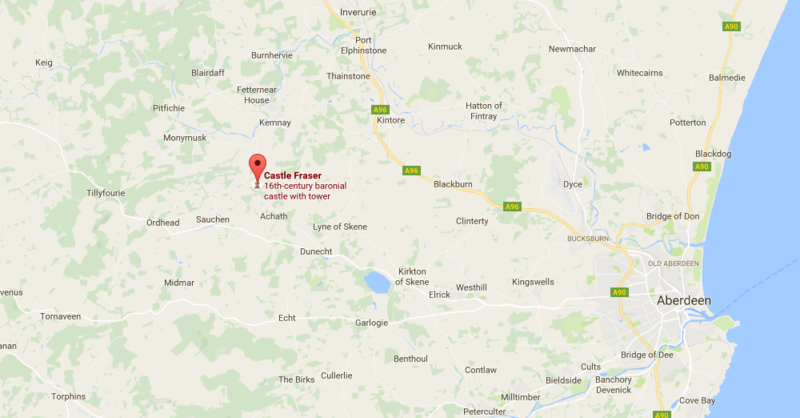 Why is it called Castle Fraser and not Fraser Castle? I should have asked that question whilst I was there. 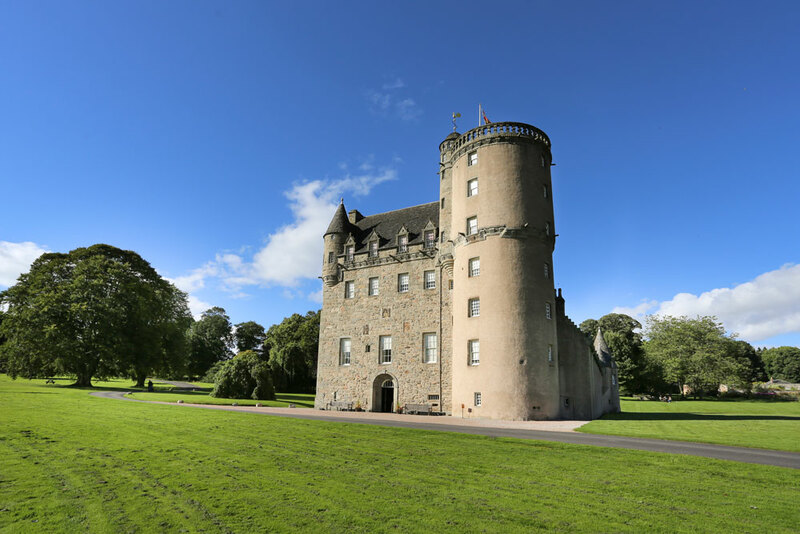 Last week I wrote an article about Drum Castle, and what a great place it is to get married. The National Trust do such an excellent job of protecting our heritage, but also in opening these wonderful places up to the public. You really should take a Sunday out to go and visit. You’re guaranteed to learn something interesting, enjoy some beautiful scenery, and get a great lunch. My boyfriends best friend got married at Castle Fraser in 2009, so I have first hand experience at how wonderful this place is. True to form, I have put together a list of 10 things I think you will love about this wedding venue. Get ready for some information and inspiration. One of the great things about Aberdeen, is its easy access to the countryside. Within a 30 minute drive of the city centre, you have endless possibilities for beautiful scenery. And if you are getting married, these possibilities extend to wedding venues too. Fraser Castle is located only 16 miles from Aberdeen. This gives you all the serenity of a rural location, with all the convenience of urban amenities. Prepare to be captivated by the manicured tree lined entrance to the estate, leading up to the imposing and brilliant castle. You’ll definitely know you’ve arrived! As with all old buildings, you could write reams about there history, and Castle Fraser is no different. It is a big part of the appeal of getting married here though, so I will touch on some of the highlights. James II granted lands around Muchall and Stoneywood, to Thomas Fraser in the 1400s. Castle Fraser becomes the ancestral home of the Fraser family. Laird Michael Fraser starts a major expansion in the 1570s, adding two new towers to create a traditional Z plan tower house. 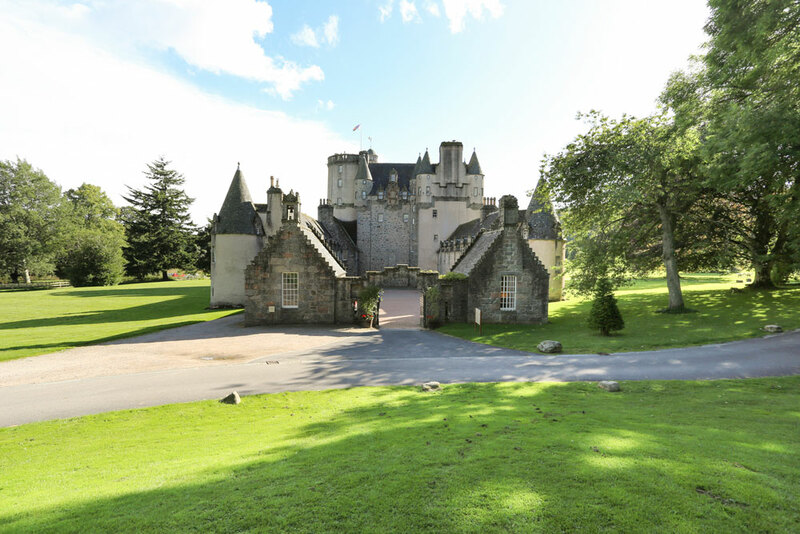 The Baronial castle is complete in 1636. Shortly after completion, Castle Fraser is captured and sacked by James Graham, the leader of the Royalist forces in Scotland. Several 18th and 19th century alterations are made, to give the castle its current day look. If you visit, be sure to find the “Lairds Lug”, a small hidden room above the Great Hall, where the Laird could eaves drop on his guests. You enter the castle through the South doorway, and will immediately get a sense of life from both the medieval and the Victorian period. This is the largest Z plan Scottish castle in existence. The atmosphere of a family home has been maintained, with furniture, portraits, and family mementos. Be sure to pay special attention to the Great Hall. 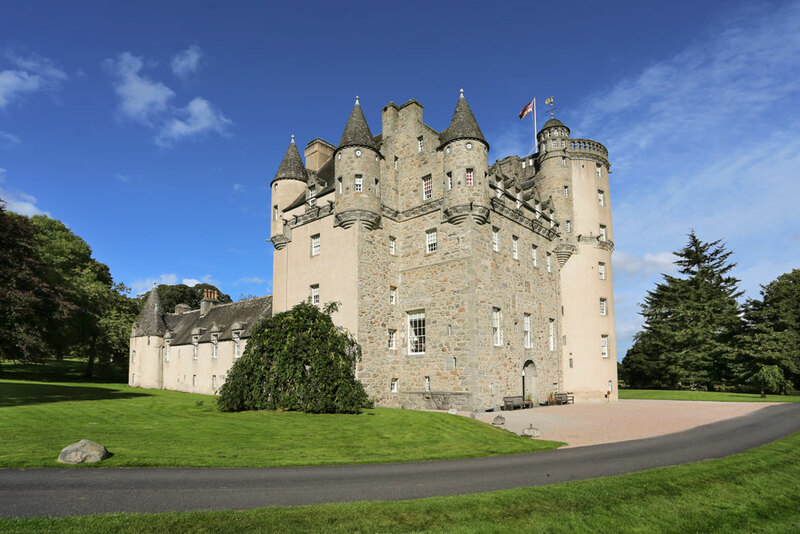 Dating back to the 1400s, it will be a big feature should you choose to get married at Castle Fraser. If you are looking to blow the kilt socks off your wedding guests, then this ancient setting has all the wow factor you will need. Oh, and take a quick look at the Bailiff’s room, which has a spy hole that looks onto the Great Hall. Excellent place to keep an eye on your guests. Another of the major benefits of these National Trust properties; the gardens are without equal. There is just something so nice about a secret walled in garden. Castle Fraser gardens has undergone major development work, to return it to the original 18th century style. 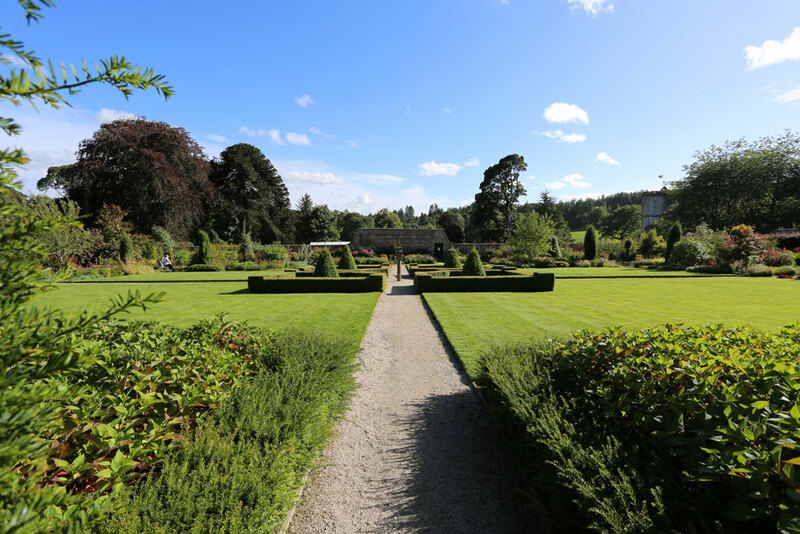 The giant walls enclose beautiful trees, shrubs, and herbaceous borders. In addition to this you can also see organic fruits and vegetables being grown. A beautiful place for a picnic, and an even better place for wedding photographs. Great backdrops, make great images! Trust me I’m a wedding photographer. Unlike Drum Castle, you don’t have a private chapel; but you do have lots of great options. Firstly, there is the Great Hall, with its high barrel vaulted ceilings, and large south facing windows. It’s a nice light and airy space on the first floor, accessed by a stone spiral staircase. The bride can be walked down the aisle to music from the Erard piano, in front of an audience of up to 100 guests. Secondly, there is the Library, a regency style room dominated by a portrait of Charles Mackenzie Fraser. Located on the fourth floor, the room retains many original features including rich wooden bookcases, and wallpaper from 1839. You can seat up to 70 guests in this space. Lastly, there is the Round Tower, which offers a truly unique and intimate experience. Accessed from the Great Hall, it offers spectacular views over the estate, and is excellent for photos. It is a small area though, with a maximum capacity of 10 people. Civil, religious and humanist weddings are all welcome. When it comes to your reception, Castle Fraser has you covered here too. Would you like grand and sumptuous or intimate and relaxed? The Great Hall with its 16th century fireplace, is the perfect location for a banquet and dancing. It can seat up to 70 guests for dinner. Or there is the Dining Room, located in the 17th century east wing, it is vibrantly decorated, containing mahogany bookcases and numerous 18th century treasures. It can seat up to 22 guests for dinner. If so, a Marquee can be erected on the east facing lawn, with the castle as a striking backdrop. This was the case for my boyfriends best friends wedding, and it was absolutely magical. The grounds at Castle Fraser are stunning, and there are lots of them. 120 hectares to be exact. There are two trails that will lead you on an adventure through parkland, woodland, and farmland. Ok, perhaps not going to happen whilst you are wearing a wedding dress, but a nice option when you inevitably return for the memories. There is even a woodland secret play area, complete with bamboo snake walk, tepees, and a tree house. This is for when you have children of course. If you want to see the most incredible panoramic views of the gardens and estate, then you have to make the climb to the Round Tower. You can have your ceremony up here, as I said earlier, assuming your guest numbers are small. Or you could have a couple of amazing wedding images, overlooking the Scottish countryside. Either way, find an excuse to go take a look. It’s one you definitely don’t want to miss. Ok so I am a wedding photographer, and I am a little bit biased. However, a beautiful backdrop is incredibly useful, when creating beautiful images. I recently did a pre wedding photoshoot at Drum Castle Gardens, for exactly this reason. In fact I actually read an article the other day, which said that you should consider your photographs, when choosing a wedding venue. Well, from a photographers point of view, Castle Fraser has this box ticked in a major way. Simply a stunning place for taking pictures. And what National Trust property would be complete, without a proper ghost story. Allegedly a young princess was murdered in the castle, leaving a blood stain which required wood panelling to conceal. Visitors have reported hearing screams, as they walk the corridors of this ancient building. Piano music has also been heard, coming from rooms with no one in them. I’m not buying any of it, but still it adds to the mystery and appeal of Castle Fraser. 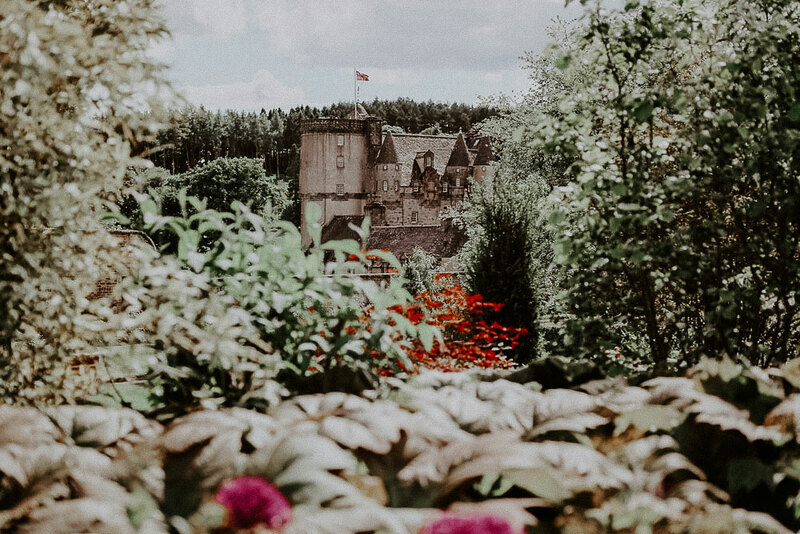 10 things I think you will love about Castle Fraser. Whether you choose this wedding venue or not, will largely depend on the style of wedding you are looking for. Castle Fraser has history and charm by the bucketload, and it’s a place I often visit at the weekends, just for fun. My boyfriends best friends wedding here was really magical. 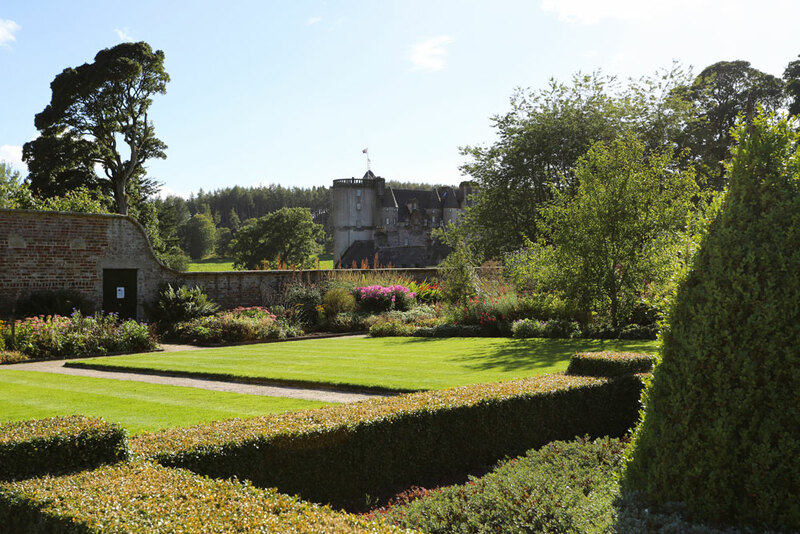 Sitting enjoying your meal in the lawn marque, with the stunning castle as a backdrop, is something to remember. You can also enjoy your celebration, with the knowledge that you are supporting one of Scotland’s leading conservation charities. At the very least, take a Sunday drive out and have a look around. It’s such a beautiful place.